In Central Mexico volcanoes Popocatepetl and Iztaccihuatl are protagonist of an Aztec legend eerily similar to the one of Romeo and Juliet. 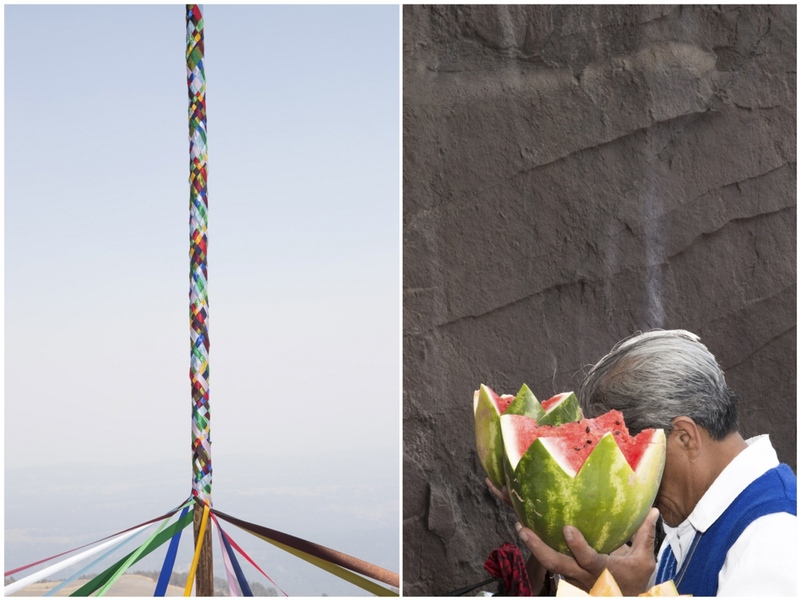 Pilgrimages, offerings and sacrifices have been performed on their slopes since ancient times. After the arrival of the Spanish, the missionaries’ attempt to impose Christianity succeeded. The purpose of wiping out the indigenous pantheon failed. 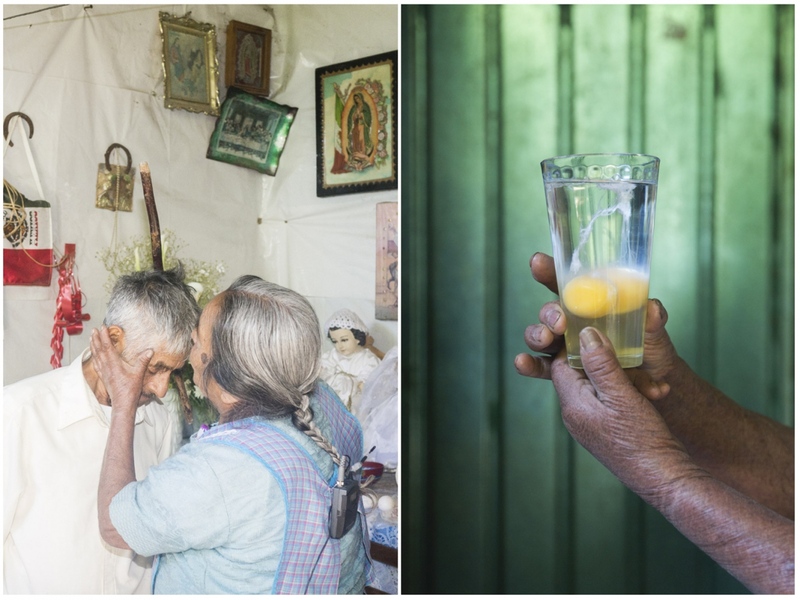 Currently more than 80% of Mexican citizens identify with a Roman Catholic faith, but pre-hispanic ceremonies are still performed and local communities maintained throughout the centuries a strong bond with nature, venerated as deified. 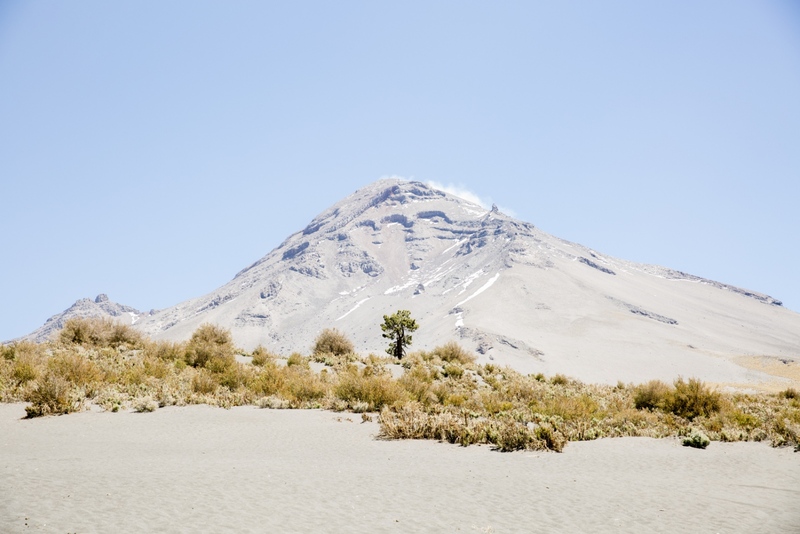 In the present time that sees mankind trying to bend nature to its own needs, volcanoes are among the few natural phenomena to instill respect and marvel. The cults which developed in their surroundings see them as alive and sentient beings. 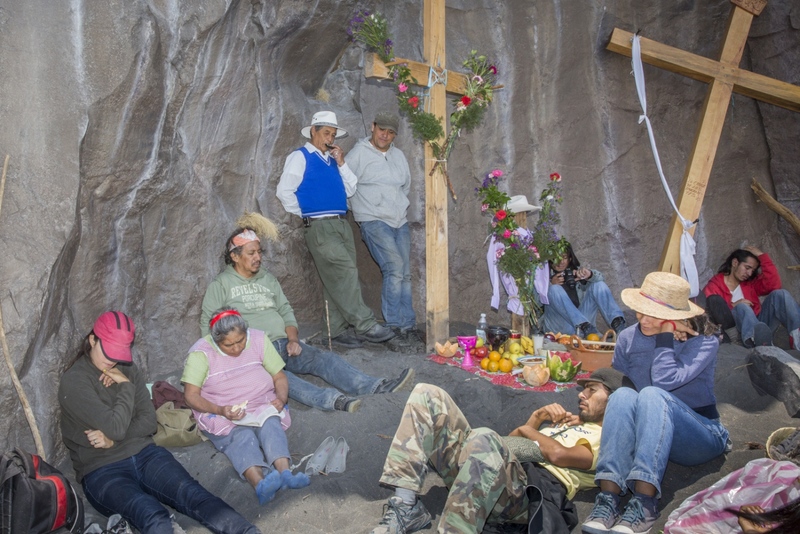 Men from a group that calls itself “Misioneros del Temporal" perform religious rituals in a sacred place on a hill close to Tetela del Volcan. 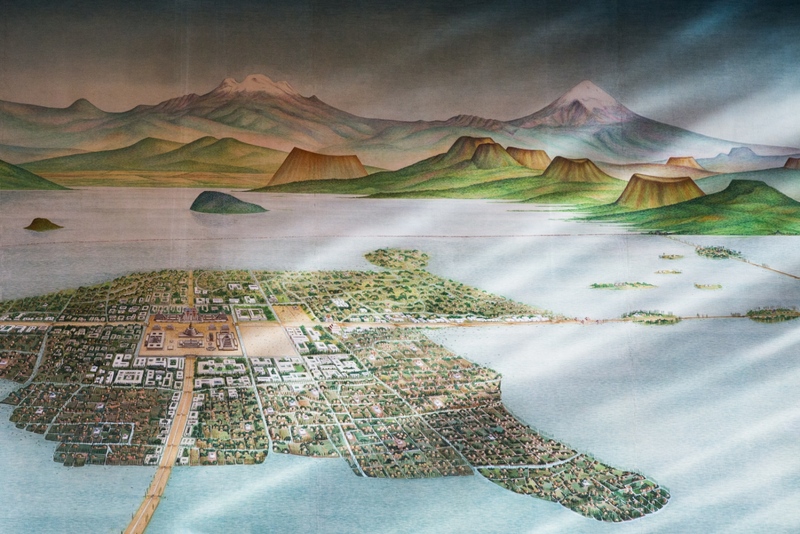 An image of Tenochtitlan, the Aztec capital above which the Spanish built Mexico City, is pictured at the National Museum of Anthropology. 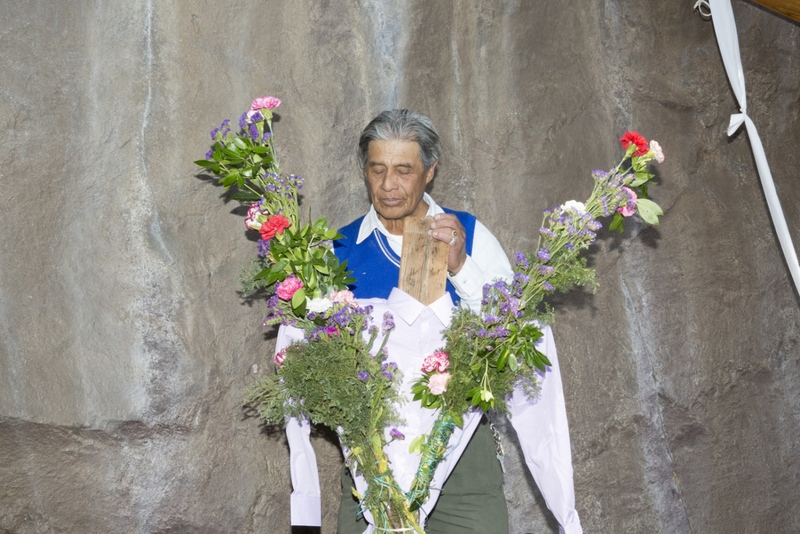 (L) Gerardo Perez, shaman, sits in the room where he performs ceremonies. (R) Remembrance a the cemetery in Tetela del Volcan. 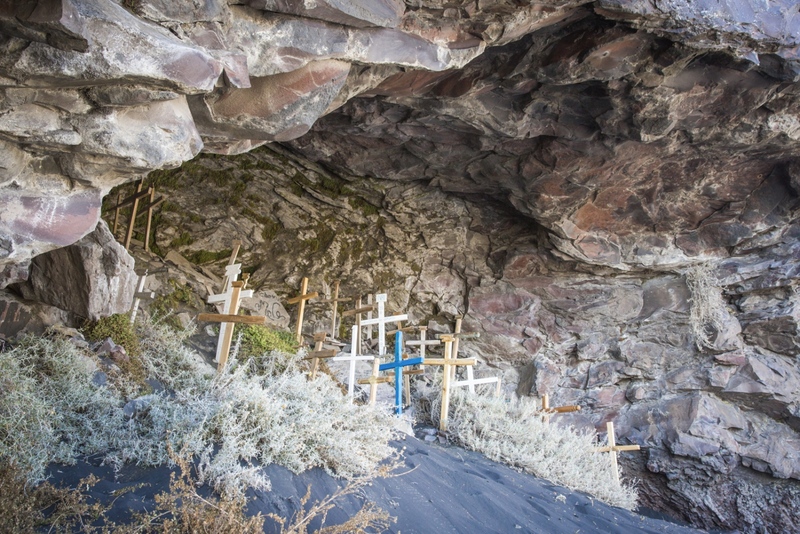 Crosses are photographed in a sacred cave on volcano Popocatepetl, where shamans called "tiemperos" and believers perform ceremonies. 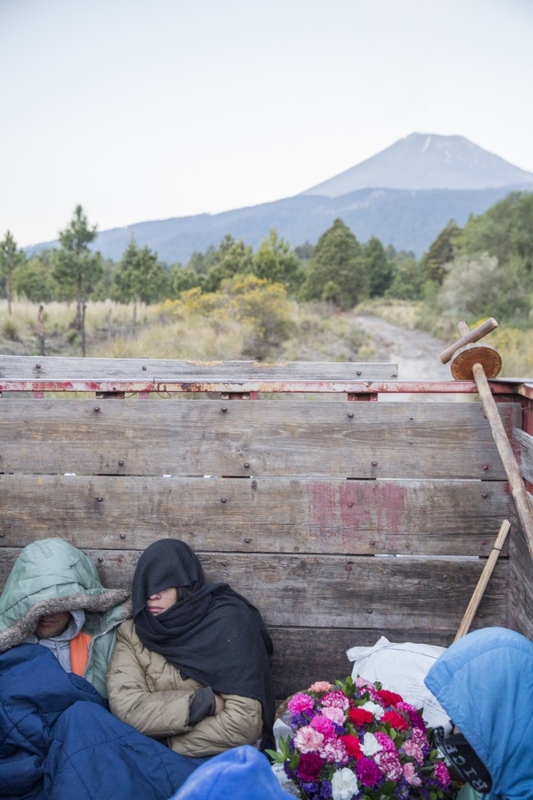 Family members of the shaman of Santiago Xalitzintla, Puebla, sleep in a truck in the early morning while heading to volcano Popocatepetl. 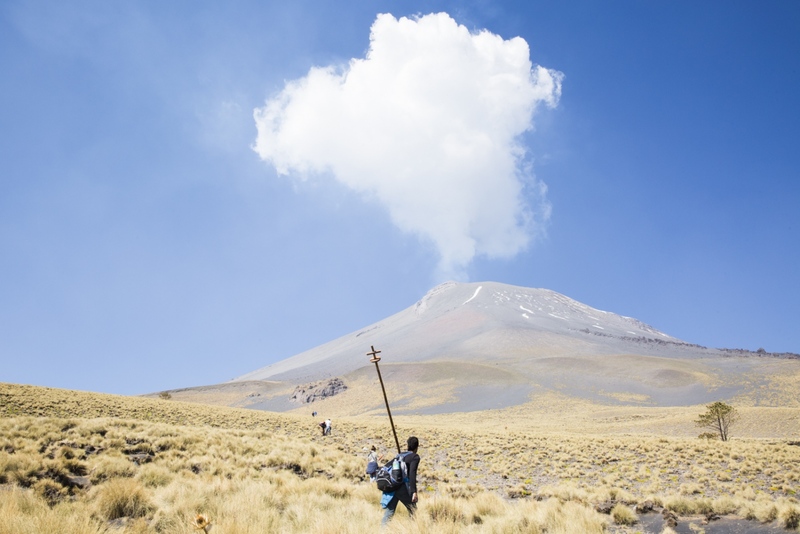 Followers of the tiempero of Santiago Xalitzintla hike on volcano Popocatepetl to perform religious ceremonies. 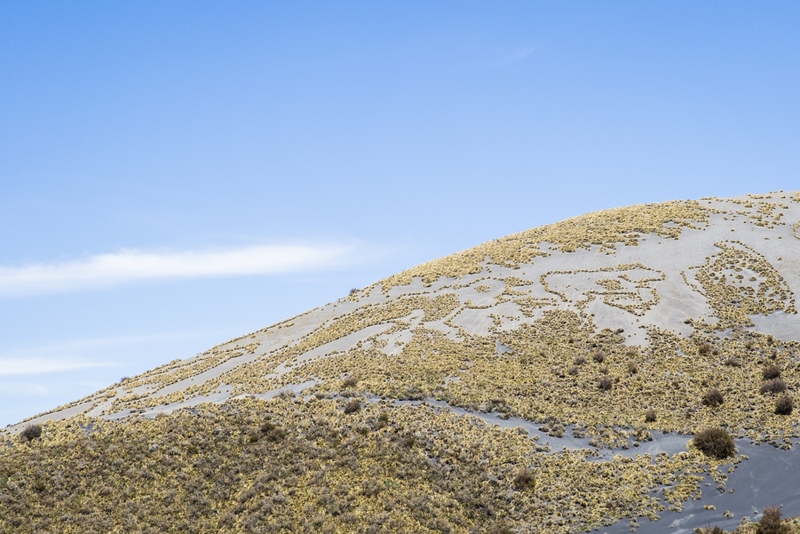 A shape that looks like a bird can be recognized in the low bushes on the slopes volcano Popocatepetl in Morelos, Mexico. 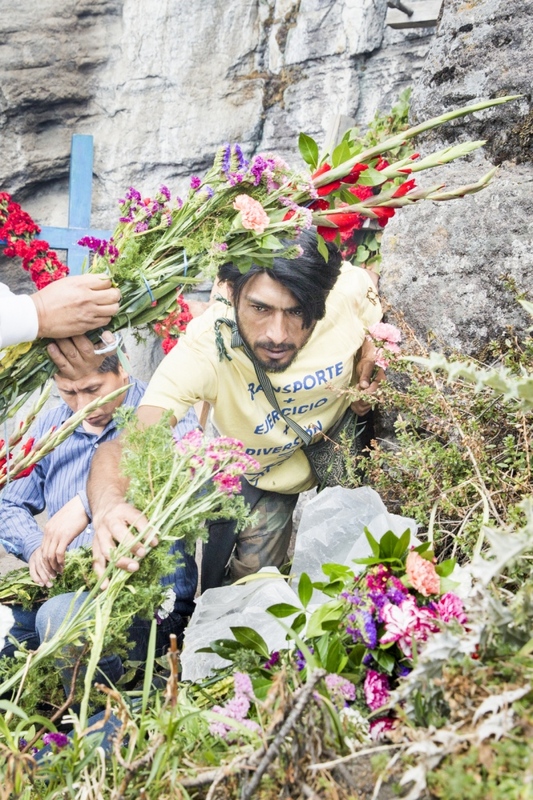 A follower of the shaman of Santiago Xalitzintla picks flowers to adorn crosses close to a sacred cave and waterfall on volcano Iztaccihuatl. 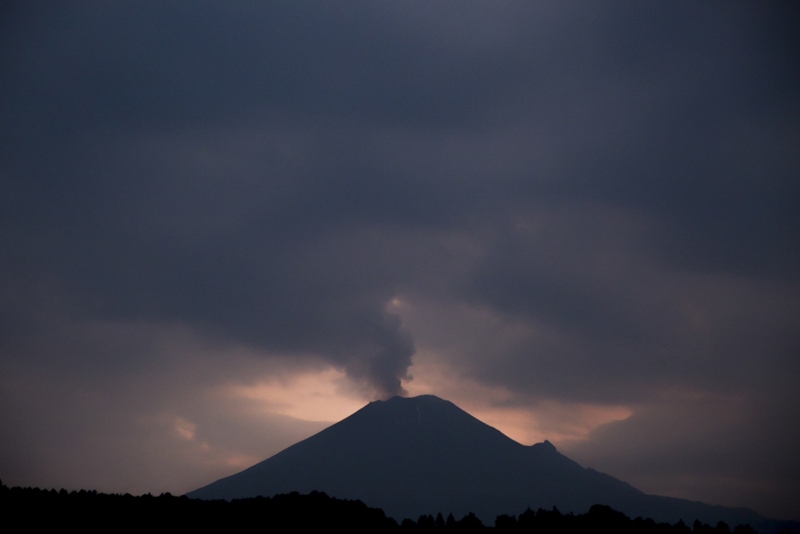 Volcano Popocatepetl is seen from Morelos, Mexico. 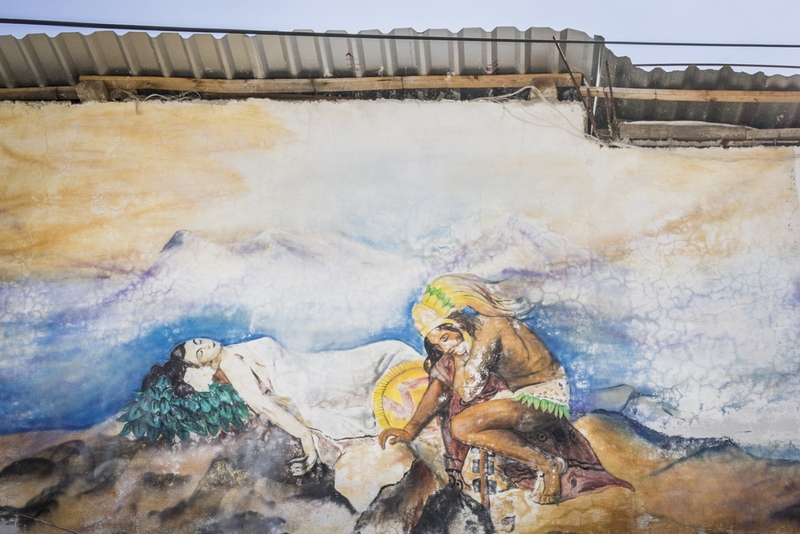 The personifications of volcanoes Iztaccihuatl (L) and Popocatepetl are painted on the wall of a shaman's house in Santiago Xalitzintla. 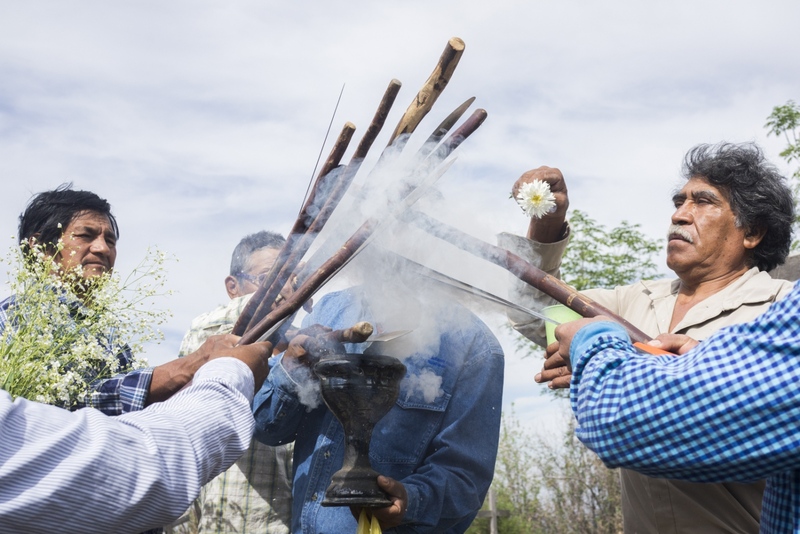 A man from a group that calls itself “Misioneros del Temporal” perform a ritual called “limpia", before entering a sacred place for prayers. 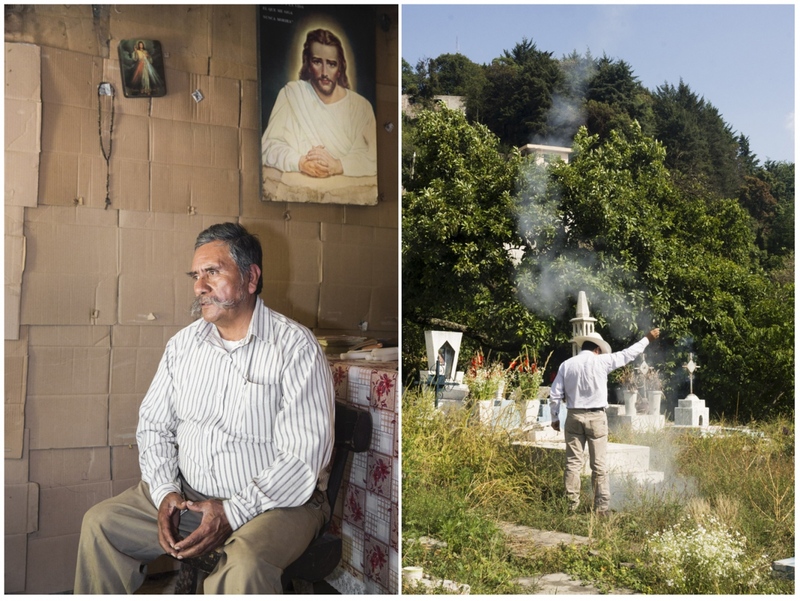 Antonio Analco, shaman of Santiago Xalitzintla, Puebla, touches a cross in front of a sacred rock called “Ombligo” of volcano Popocatepetl. 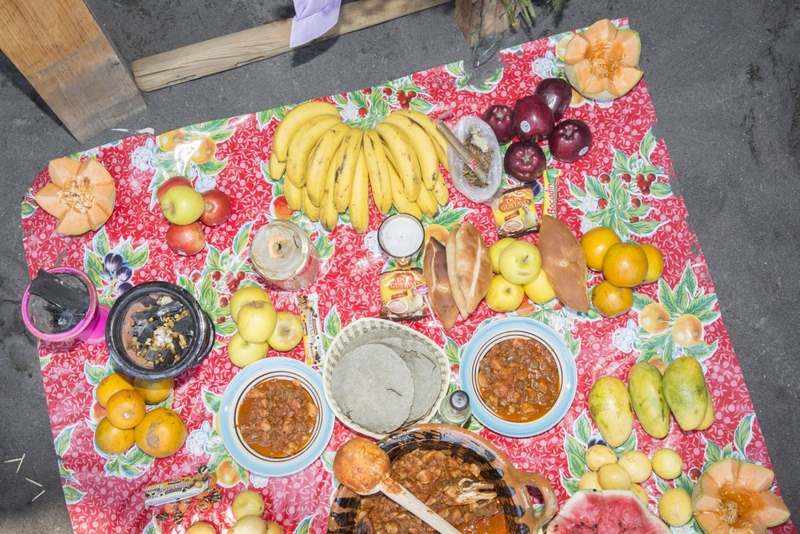 Food offerings from a religious ceremony are photographed in front of a cross at a sacred rock called “Ombligo”, of volcano Popocatepetl. 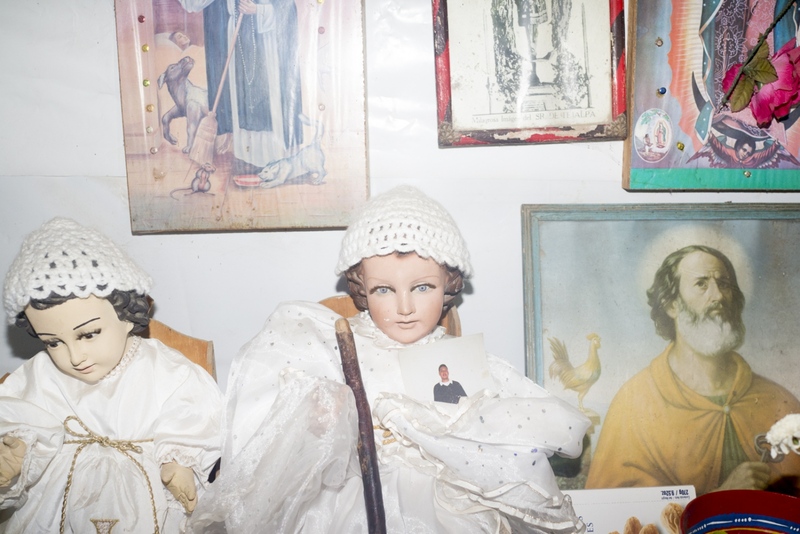 Dolls dressed like saints and the photograph of a man who was thought to have disappeared are photographed in the house of a shaman. 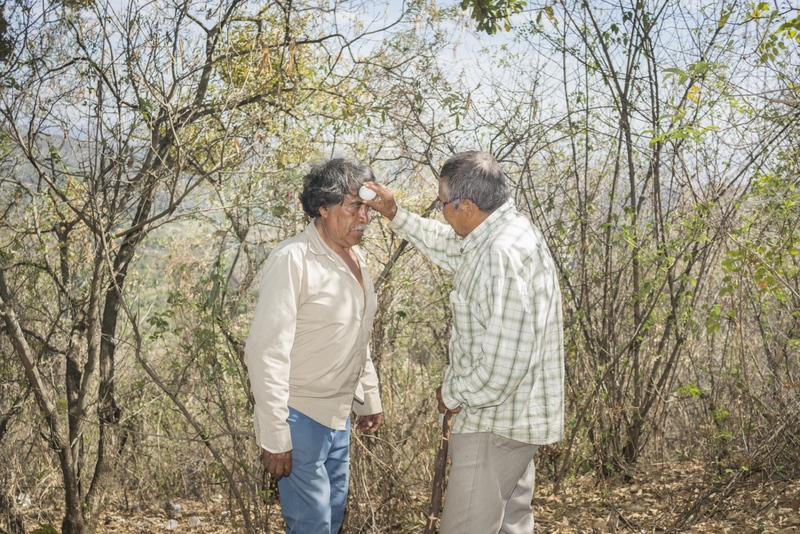 (L) Doña Vicenta, shaman, performs a ritual called “limpia” to heal a man suffering from migranes. (R) The shape of eggs in a glass of water helps her interpret the nature of the patien's sickness. 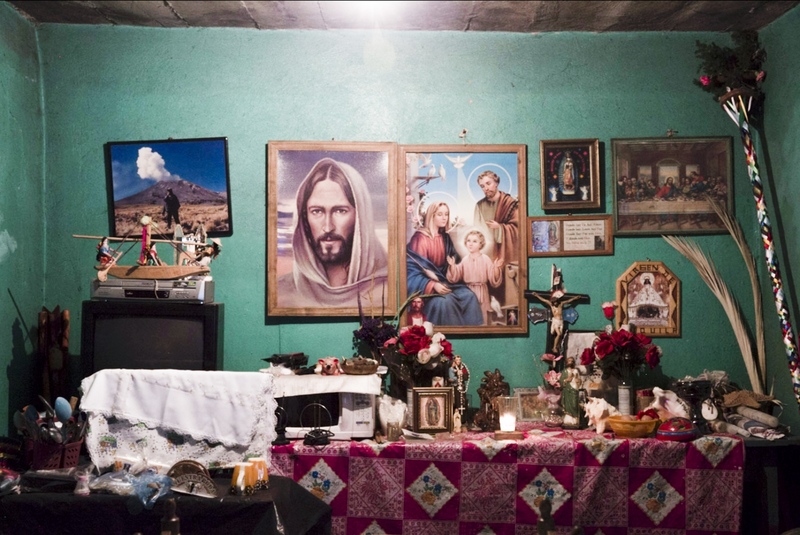 The dining room in “tiempero” - shaman Antonio Analco’s house is photographed in Santiago Xalitzintla, Puebla. 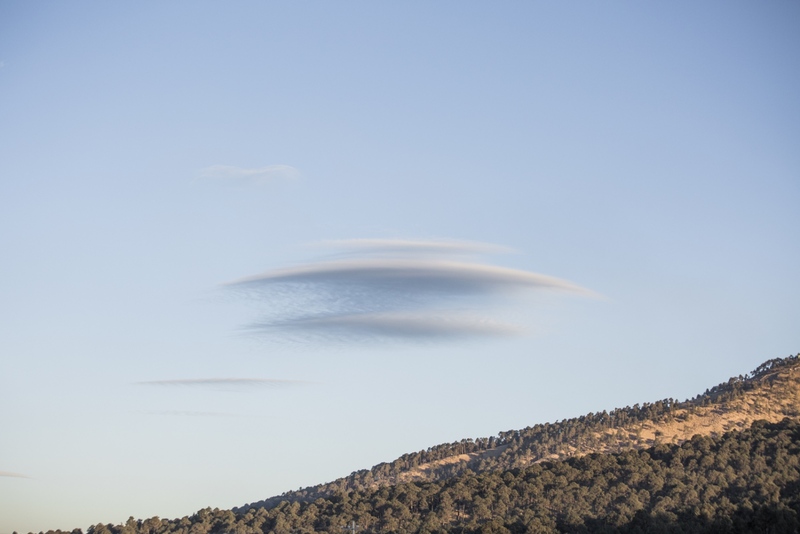 Clouds are photographed over the Paso de Cortes, the mountain pass which links volcanoes Popocatepetl and Iztaccihuatl. Followers of the shaman of Santiago Xalitzintla rest after a four-hour hike they undertook to get on volcano Popocatepetl. Antonio Analco, shaman of Santiago Xalitzintla, Puebla, plays harmonica surrounded by some of his followers on volcano Popocatepetl. Volcano Iztaccihuatl is photographed from volcano Popocatepetl. 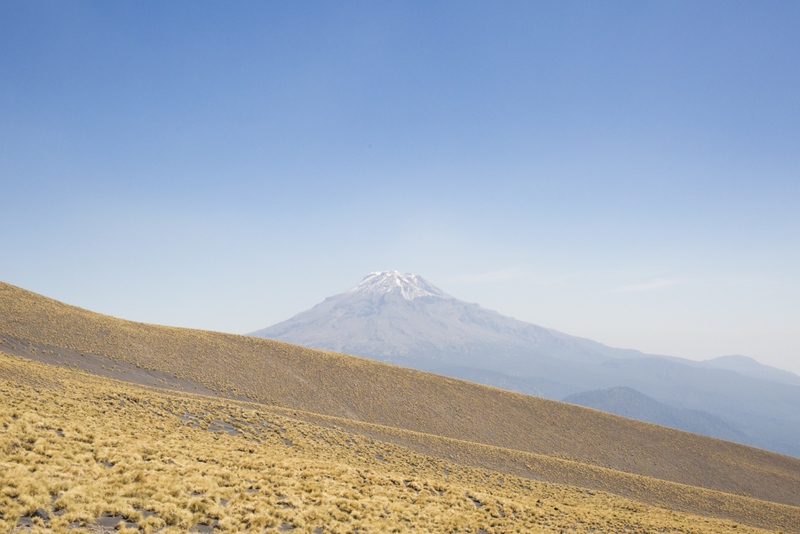 The two volcanoes are connected through the Paso de Cortes. 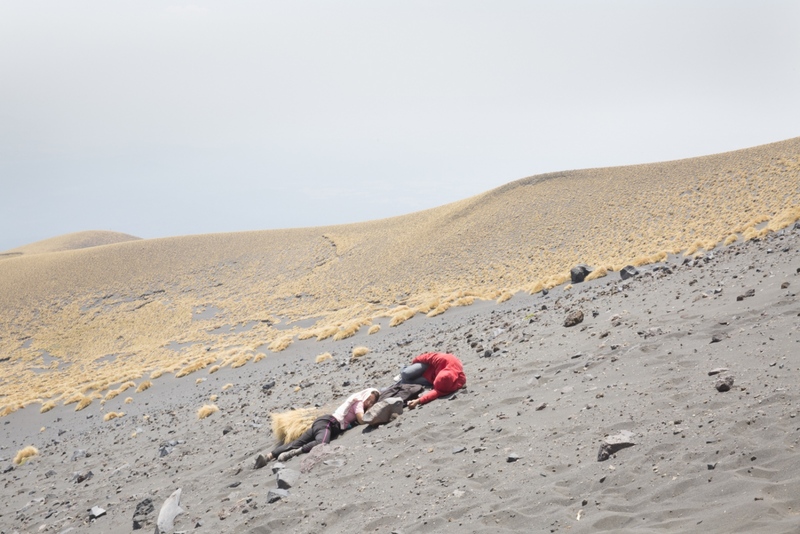 (L) A follower of the shaman of Santiago Xalitzintla rests after a four-hour hike on volcano Popocatepetl. (R) A volcanic stone on the Volcano. 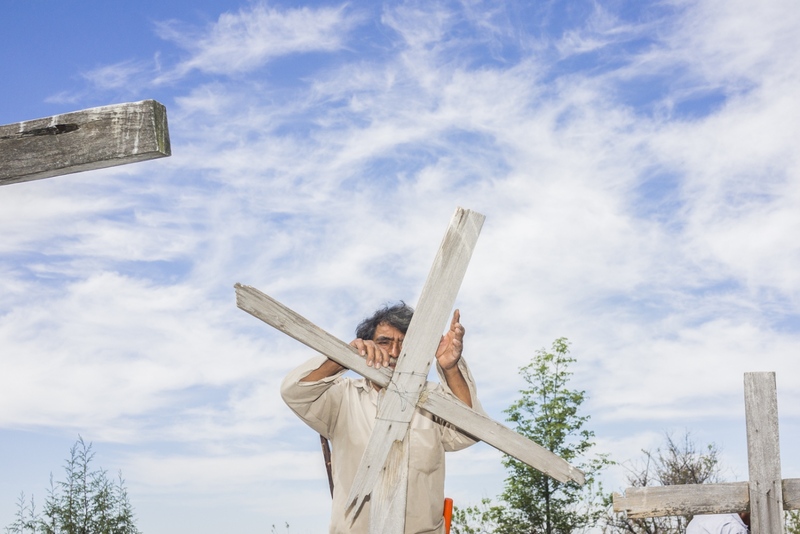 A man from a group that calls itself “Misioneros del Temporal”, straightens a cross in a sacred place close to Tetela del Volcan. (L) Palo de Mayo. 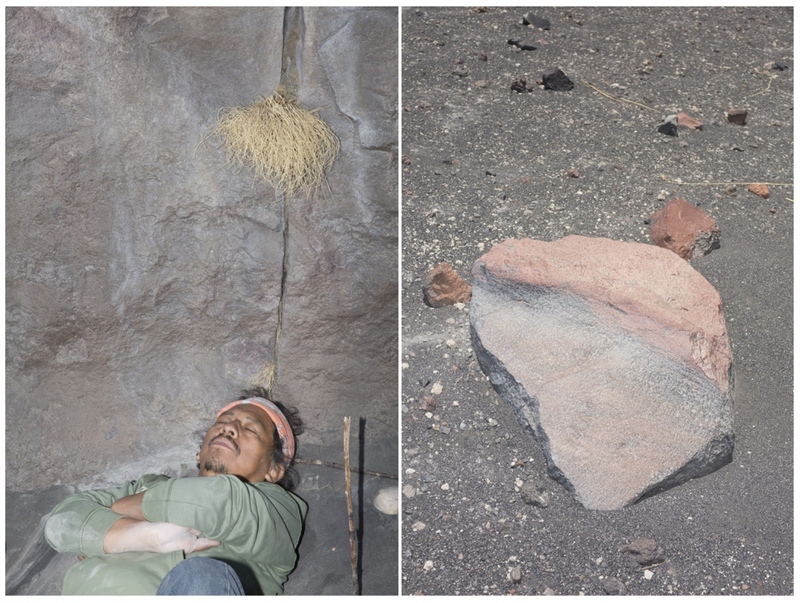 (R) Antonio Analco, shaman of Santiago Xalitzintla, Puebla, makes an religious offering on volcano Popocatepetl. 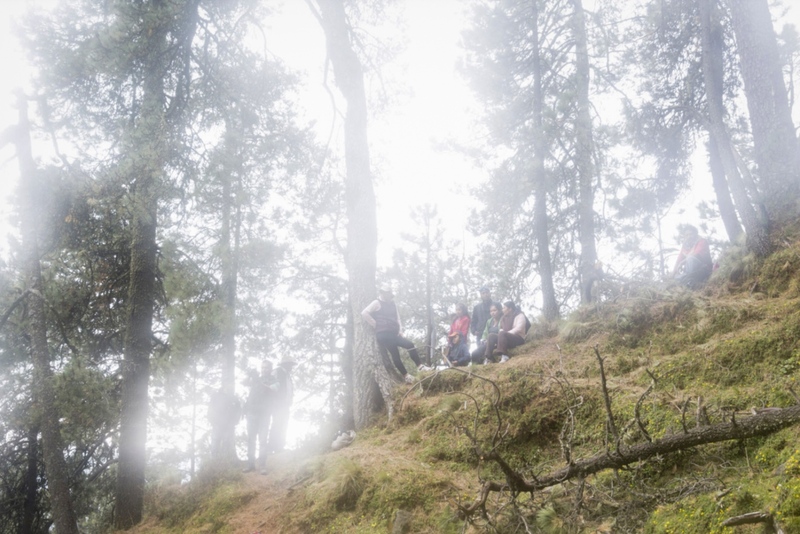 People attending religious ceremonies linked to the beginning of the rainy season are pictured on volcano Iztaccihuatl close to a sacred waterfall. 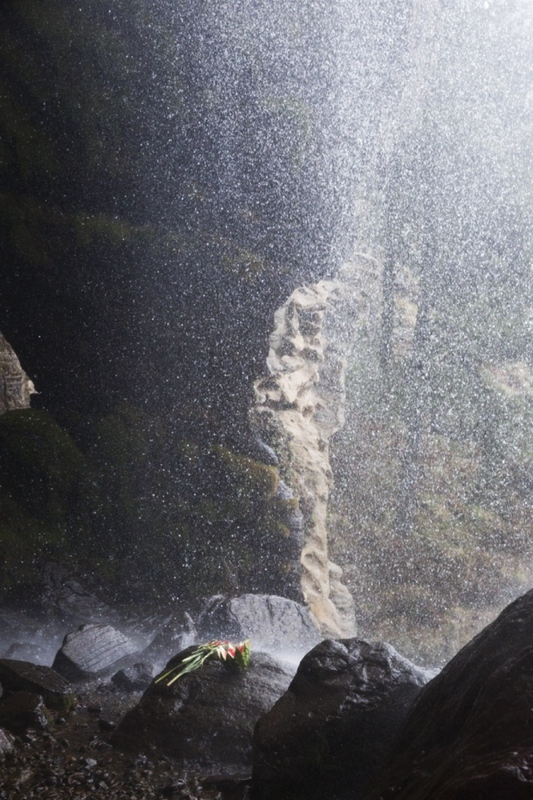 A watermelon is left as an offering to Iztaccihuatl, a volcano in central mexico, under a sacred waterfall situated on the volcano.